My admiration for the S&W Military and Police line of semi-automatic handguns has done nothing but grow over the last 6 years or so. The guns have proven themselves to be worthy of consideration for law enforcement, federal contractors, competitive shooting, recreational shooting, and self defense, including concealed carry. 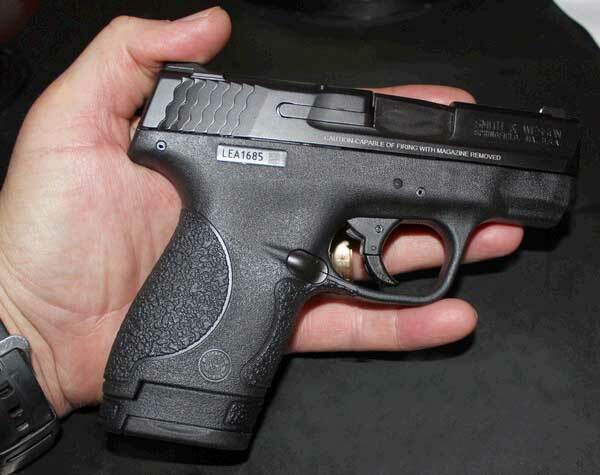 The Smith and Wesson Shield is yet another continuation in the line, particularly focusing on concealed carry. I've been hesitant to recommend guns that are very small compacts or large sub-compacts, one of which this gun is. That has changed with the Military and Police Shield. The gun fixes every reason I have rejected most "pocket guns" of any manufacturer. I picked up the M&P Shield 9mm pistol at Academy Sports, that in general provides new handguns at some of the lowest new gun retail prices in the country. Before putting down the cash I tested the trigger pull, user controls, magazine release and operation. Then I paid and took home a gun that already had a reputation that is well embedded in the world of concealed carry. A reputation for dependability, better than average small gun accuracy, being easy to conceal, and being an enjoyable gun to shoot. 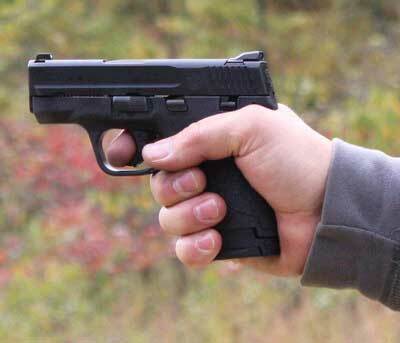 The last not a real characteristic of most very small handguns. 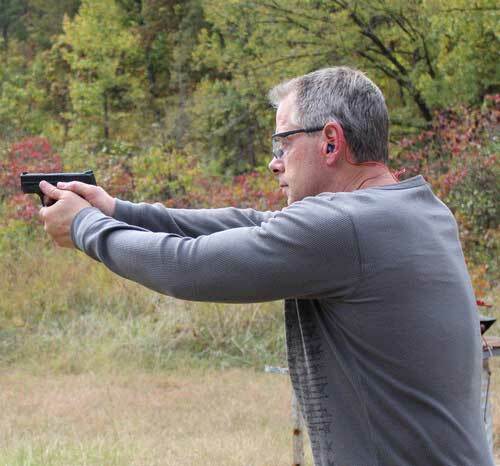 The first couple of trips to the range, putting a total of about 200 rounds through the little gun proved it to be what it is reputed to be. And what I expected it to be. 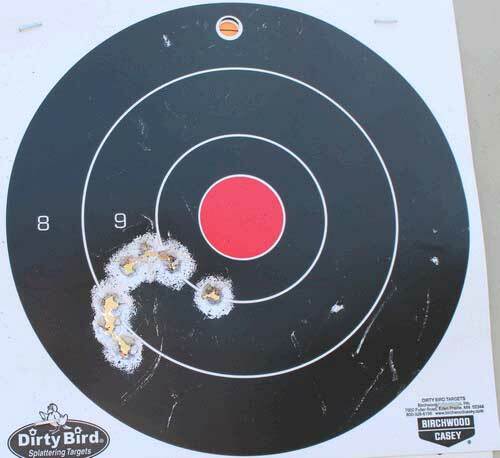 It's a pleasure to shoot, with confidence building characteristics that go with a quality handgun. Not to be unrealistic. It is a very small center fire handgun. That means making precision hostage rescue shots is not likely with it. 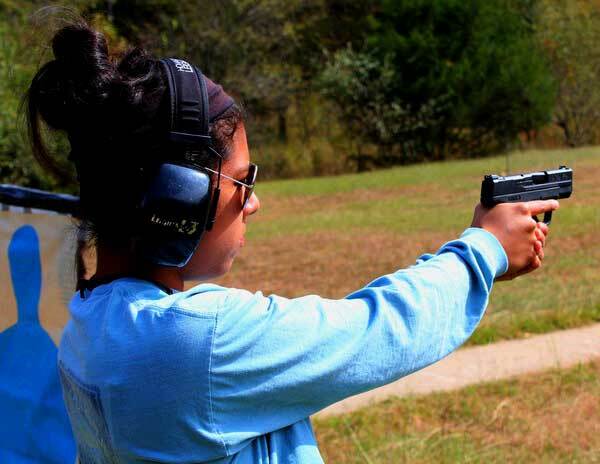 But as far as using the gun to defend yourself at the relatively close ranges of 35 feet or closer, it will meet the challenge if you do your research and practice. The sights on my gun are geared to slight left grouping. The first picture shows one of the first runs with the gun. The second shows one typical of groups after getting used to the gun. No matter who shot it. Easily within the bounds of successful self defense shooting, just a bit left. As every gun owner/shooter knows, that's not gonna be good enough. For point and shoot aficionados, it will be fine, but for us shooters, well ...... we'll need to work on it. So, I went after the front site with a steel punch. The front site is the only one adjustable for windage. With mallet in hand, I padded the punch and started pounding. Lessened the padding and pounded some more. Used the bare punch and still never moved the site 100th of an inch. I'll get that worked out, but just know that any adjustment will be difficult. Interestingly, the grip fits my hand and my daughter's which is about 35% smaller than mine. That's with the 8 round magazine. The grip with the 7 round mag fit her hand with mine being a little under-accommodated. In a lot of best-in-class guns the manufacturers have still demonstrated some kind of stupidity in something. In this gun it is one 7 round magazine, one 8 round mag. No reason for not just making the mags all 8 round. The user controls on this gun oddly vary significantly in operation from gun to gun. The safety, slide lock, take down lever all have different degrees of ease of use from gun to gun for some reason. Anybody will be able to work it out on any gun, the controls loosening up after some use. But another annoyance that should be corrected by S&W with some consistency in manufacture and assembly. Another annoyance. Not a deal breaker. The big plus in this gun is grip control, easy sight alignment, and dependability. 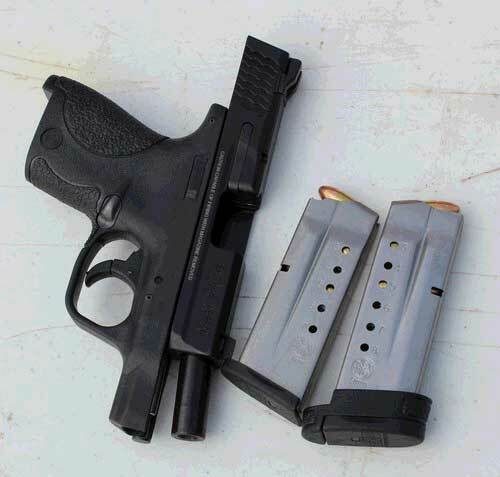 This is a small gun that comes in 9mm or .40 S&W that you can confidently defend your and your family's lives with. And you can even do it with a little longer than average distance to the target if necessary with a gun this size. Concealing the gun is a breeze, even for this larger than average sub-compact or smaller than average compact ....... (whatever) gun. 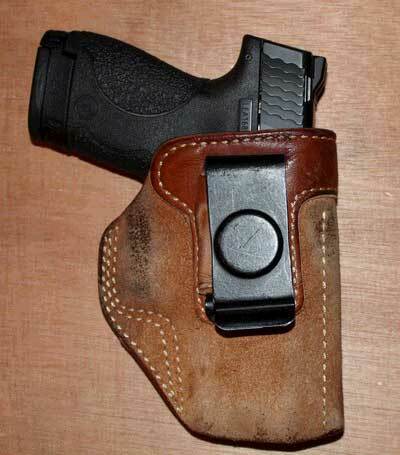 The holster shown is an IWB one I've concealed GLOCK 19, 23, 22, Sig 220, Taurus 24/7, and others. 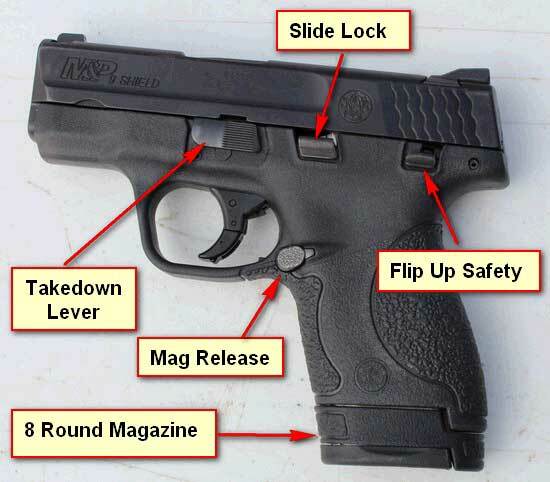 It takes the M&P Shield fine, covering the trigger guard while leaving the grip fully accessible. The popularity of the Shield makes for quite a few holsters specifically for the gun easy to find. A simple Uncle Mikes pocket pouch will safely contain the gun's trigger guard for cargo or jacket pocket carry. 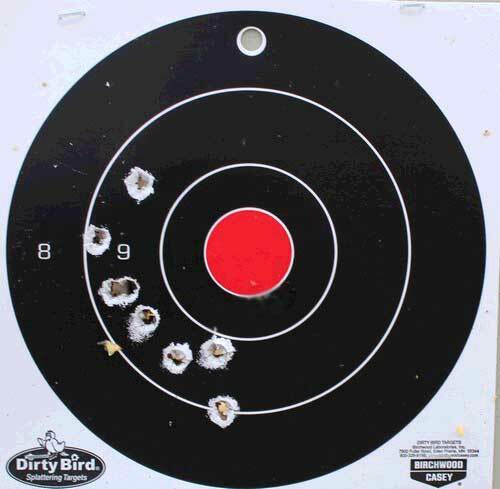 A few important stats: 9mm; Striker fired; Barrel length 3.1"; Sights - white dot; Overall length: 6.1"; Weight: 19 oz. ; Trigger pull 6.5 lbs. 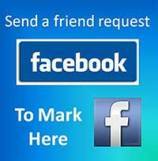 (short and crisp, making it feel lighter); Polymer frame. NOTE: At last count S&W makes the gun in 18 different varying configurations. The Smith and Wesson Military and Police Shield comes in multiple calibers and configurations, with and without the external flip up safety. It will conceal in an IWB, belt, pouch, or ankle holster. It will provide adequate control, sight alignment and accuracy with practice. It is a winner worthy of consideration in anybody's concealed carry arsenal. Updates to come: I'll be working a lot more with the Shield, particularly in fine tuning the sights for confident, center target accuracy. Updates will be posted here.